Fraley's Specialties has been serving the Ohio community since 1966. 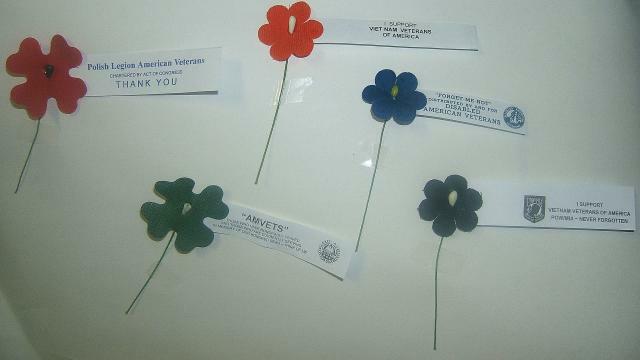 We specialize in producing flowers for veterans organizations as well as any group wanting a fundraiser in this manner. We also perform government packaging services for companies who do business with the government. Our staff offers quality and reliable services you can count on. In addition, our friendly and professional staff is here to answer any questions you may have about our company or our services. Whether you need a custom made flower for your organization or packaging services which comply with all Mil-P-129 and Mil-P-2073 specifications, we have what you need at prices you can afford. At Fraley's Specialties, our goal is to provide you with courteous, expedient, professional service of the highest caliber. Browse our Web site for more information about Fraley's Specialties. If you have any questions or would like to speak with a Fraley's Specialties representative regarding our products or services, please feel free to contact us through any of the methods available on our "Contact Us" page. At Fraley's Specialties, the customer always comes first.